I am indebted to my friend, G. W. Hunter, for the little idea I shall endeavour to illustrate this month. 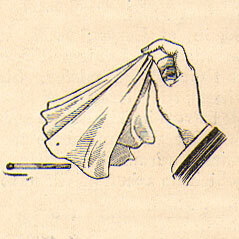 The trick consists of borrowing a match, placing it into a handkerchief and breaking or allowing it to be broken into several parts The handkerchief is now shaken, yet the match is mysteriously found to drop out wholly restored, notwithstanding the fact that the spectator is certain that he broke the match. The conjurer offers to repeat the trick, and yet again the match is restored. This clever idea is really an adaptation of the old ring and handkerchief trick, in which readers will remember that a ring is sewn into the corner of a handkerchief. 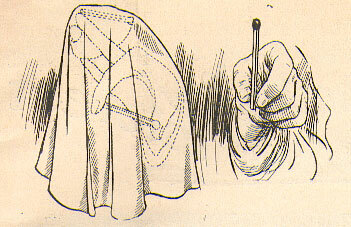 To prepare for the trick a pocket handkerchief must be obtained, in the hem of which is concealed two matches, one in the corner and one in the middle of the hem. Now borrow a match and place it under the handkerchief of course what follows is obvious, as the illustrations explain the idea better than I can. 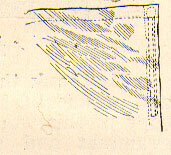 The match is exchanged for the one concealed in the hem, and the borrowed one left in the folds of the linen, where it will remain until shaken out. The match is now broken, the handkerchief shaken out, and there you are. The repetition is, of course, worked the same, except that the handkerchief is spread over the table, a borrowed match laid in the middle, and the handkerchief folded over the match. This brings the concealed match into an easy position for the spectator to grasp in the middle of the handkerchief. This trick can be applied to many ideas, for instance, a torn chosen card is dropped into small pill box, and placed under a handkerchief for safety, really a similar box is in the handkerchief, the box containing the card being carried away in the palm of the hand, secretly, and exchanged, at the conjurer’s leisure, for a similar box but empty,this is dropped from the hand on to the table, in the action of shaking out the handkerchief, and the torn card is found to have vanished.